It has been said that a true friendship happens when you do not see someone for years at a time and then when you do, it’s like no time has passed at all. 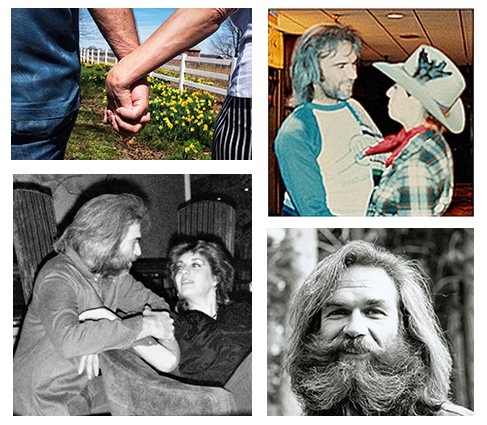 Such is the case with William Lee Golden and Simone Staley. The bond of friendship was built upon intense feelings, the kind of gravitational pull that makes up all great relationships. His story as a member of the Country Music Hall of Fame inductee the Oak Ridge Boys is well-known but that mutual gravitational pull that pulled an 18 year old Simone towards a then bachelor William Lee Golden all those years ago is one that needs to be told. It all started when Simone purchased the Oak Ridge Boys’ “Together” album and while looking at the cover of that LP, Simone was instantly drawn to William Lee Golden, she didn’t know how or why she was, she just was. She knew she would meet him someday and, by Labor Day weekend that year, she was first row for her first Oak Ridge Boys show. Although she did catch a scarf that Golden threw to her during the show, she didn’t meet him that day. That meeting would come in October of 1980 when Simone and her friend Karen went to Knott’s Berry Farm for a show and managed to meet Golden. Karen took a photo of that first encounter and the attraction for both was instant. They hung out together and cared deeply for one another over the next couple of years. However, Simone, as a young woman, was lovingly steered in a different direction by her parents. As life sometimes takes people down different paths, little did they know after spending time together in 1982 after a show at the Houston Livestock Rodeo at the Astrodome would be the last time they would see each other. Fast forward to May of 2009 when both had recently lost their moms, Simone and Golden re-kindled their friendship and bonded over their common thread of art and painting. She crafted a painting based on a photo by Jack Jones in 1981 and that painting remained something Simone often thought about and, little did she know, that he kept the painting all of those years, even pulling the artwork out of the rubble after a tornado destroyed most of his house. Golden didn’t want that painting to be gone. Always around others and rarely alone, romantic intentions back when they would see each other in the early 1980s, no matter how much both Golden and Simone were feeling for one another, could come to pass. The pilot light of those feelings, however dim, remained flickering through the years via the painting and the emotions it would bring for both. Those feelings Golden held weren’t even something he had the chance to tell Simone back then, because they were always around that group of others. In fact, they weren’t made known until April of 2013, when Golden started calling Simone daily, months after being served divorce papers. By the summer of 2013, Golden invited Simone to come to Tennessee and travel with him to Alabama and Florida to meet and visit with some of his family and friends. During that time traveling together, they really got to share their feelings and really be together. After the rest of the year trying to see each other as much as possible, come April 2014, they found a home in the rolling hills of Middle Tennessee where they settled down together, bringing their pets together and seeing those pets happy to have room to roam, not unlike Golden and Simone. 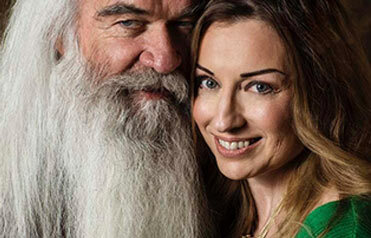 And with that, William Lee Golden and Simone have finally, inexplicably found each other and their story is a story for the ages, like a real-life storybook tale. They have weathered the sands of time and the torrents of life to eventually reconnect through the powerful bond of friendship that has blossomed over the past couple of years into the most powerful, example of soul mates, where some sort of twin souls have tuned into each other and found friendship and, finally, love. They both agree they saved the best for last!